March is a tricky month for predicting flowers. The weather prognosticators have gotten a little better over the years, but predicting more than two weeks in advance can be a dangerous business. We can all remember years when a long period of mild weather over the winter is suddenly interrupted by an unexpected plunge into the deep freeze just as flowers are opening. I recall one year when the International Magnolia Society had their meeting in Seattle in mid March and the whole Georgia-Puget Basin (what we now call the Salish Sea) was affected the same week by a serious Arctic blast. The magnolia group toured the Botanical Garden the next day and all I can remember is blacked buds. The Ides of March (March 15th) brought Julius Caesar bad luck (indeed, the very worst kind of luck), but thankfully, killing frosts are rare in mid March at UBC. And judging by the numbers of flower buds visible on our trees, 2018 will go down as one of the better years for large flowered magnolia flowers. 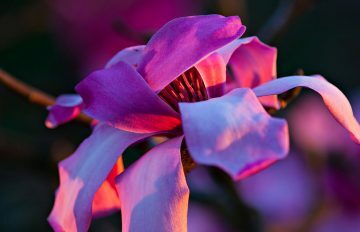 Magnolias are among the most ancient of flowering plant lineages. There are a number of characteristics that indicate this, including that the flower parts are spirally arranged, rather than in definite whorls, and that the showy, outer flower parts are not differentiated into separate sepals and petals, as they are with the flowers of most recently evolved plants. The name for these undifferentiated petal-like structures is tepals. As well, Magnolia flowers are pollinated almost exclusively by pollen-feeding beetles. Magnolias are not adapted to pollination by bees or other modern insects, which partly explains why the flowers are so large and sturdy and produce little or no nectar. Among the earliest to flower in the Botanical Garden, usually in mid to late March, are selections of Magnolia sprengeri. Professor Sprenger’s magnolia is from the mountains of central China and is considered the cold-hardiest of the large-flowered Asian magnolia species. It is similar to Magnolia campbellii, but has later-opening, less symmetrical flowers. People generally recognize this species by its comparatively long and narrow tepals, which are usually pink or rose pink on the outside and creamy white toward the inside. This describes Magnolia sprengeri var. diva—the other botanical variety, M. sprengeri var. elongata has tepals that are creamy white on both sides. Prior to flowering, Magnolia sprengeri can also be recognized by the almost horizontal posture of its large, fuzzy, yellowish grey flower buds. When trees are in flower, there is often an overwhelming fragrance of wintergreen or chewing gum in the vicinity. There are a number of selections of the popular M. sprengeri var. diva in gardens. Located just inside the David C. Lam Asian Garden on Upper Asian Way is a seedling of the famous cultivar ‘Copeland Court’, which is noted for its rosy-purple-backed tepals and intoxicating fragrance. Our plant more resembles the wild form of var. diva with its massive structure and large, rich rosy-pink-backed tepals. ‘Eric Savill’ is another garden seedling selection of var. diva, but with extraordinary hot-pink-backed, rumpled tepals. Once open, the strong pink bleeds through to the inside, making the flowers, which are some 25 cm (10″) , look like melting raspberry-ripple ice-cream. There are two specimens in the Garden. One is near the west end of the boardwalk by the Ting, and the other—a much slenderer, taller tree—at the west end of the parking lot. Behold the Ides of March when the magnolias are blooming. Visit our forums for more photos. Magnolias are popular plants, and many kinds are available commercially in the Vancouver area. The Plant Centre at the Shop in the Garden at UBC Botanical Garden regularly stocks a wide range of newer cultivars, as well as less-commonly-available magnolias derived from the Botanical Garden’s collections. Spring is the best time to Shop for magnolias at UBC. 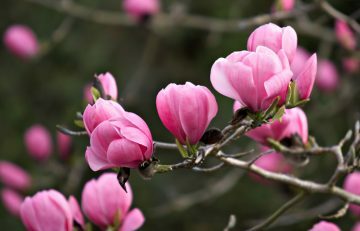 In general, plants are available from mid-March into the early summer, but it’s best to check with Shop staff to see whether the magnolias are in. Is there a good source to obtain some of the least common species of mags in the lower mainland ?